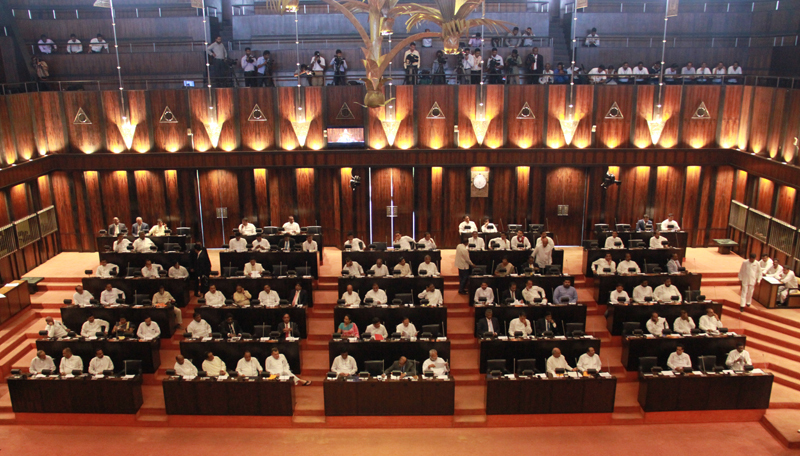 Prime Minister Ranil Wickremesinghe had invited all MPs outside the UNF to join in the Government. Prime Minister Wickremesinghe made this open invitation at the re-launch of Gam Peraliya and Enterprise Sri Lanka Programmes at Temple Trees recently. “I would like to invite all MPs outside of the UNF to come and join. Let us work together. No one could stop if we joined together,” the Prime Minister said. “We took a great challenge in 2015. Sri Lanka was the most indebted nation in the world during that year. The country was isolated then. However, we managed to turn things around. Sri Lanka no longer faces war crime charges,” he added. The Prime Minister said the Government had short, medium long term plans. “No one will be able to defeat us if we manage to fulfill all our plans,” he said. This is a strong appeal to those who want a democratic way out for the country, especially to the Tamil national problem. What do we hear from the other side? ‘Request the government of Lanka to produce a clear timetable for implementation of its outstanding commitments, including the establishment of the four pledged mechanisms. Request the government of Lanka to take urgent steps to deliver on accountability, including through the establishment of a hybrid judicial mechanism, as well as through incremental measures such as the strengthening of witness protection mechanisms, the retroactive incorporation of international crimes and modes of liability into domestic law, and the establishment of a Special Prosecutor’s office. Reinforce the High Commissioner’s warning that cases under universal jurisdiction will be pursued by member states in the absence of a credible accountability mechanism. Re-affirm the recommendations of the final report of the Consultation Task Force on Reconciliation Mechanisms, with a request to the government to adopt a timetable for the implementation of its recommendations. Acknowledge the prevailing ground situation in the North and East, including persistent patterns of serious human rights violations, militarization, surveillance and intimidation, and the barrier that it poses to lasting reconciliation. While encouraging member states to issue the strongest possible statements at the forthcoming general debate, we also look to them to begin to send some clear and unequivocal signals that March 2019 does not represent the end of the line for the HRC’s formal engagement – and that Sri Lanka will remain on its agenda if Resolutions 30-1 and 34-1 are not fulfilled, as looks almost certain. The window of opportunity to make headway with the kind of changes that are needed, while narrowing at a rapid speed, must be kept ajar. While such agitations are going on, Civil Mass Movement led by Ven. Dambara Amila Thera and others is conducting a campaign to appreciate and take forward the performance of democratic politics in the recent political upheaval. Among parties representing minority communities there are serious discussions about the ethics of performance of various leaders. Because the last political upheaval divided the Sinhala people into two broad political groups based on the discussion on constitution. It is the opening for the minorities to stand for the self determination honestly and prudently. Some behaved unethically showing greed, above consistent national liberation. Hence there is the proposal that those who aspired to contest under the Tamil National Alliance (TNA) at forthcoming elections must be subjected to a DNA test to ascertain that they did not have qualities of jumping and flying! TNA MP G. Srinesan made this statement addressing a Thai Pongal event at Makilurmunai in Kaluwanchikkudi, Batticaloa. Interestingly he made this remark while speaking about a TNA Parliamentarian, who crossed over to the Joint Opposition after former President Mahinda Rajapaksa was appointed Prime Minister in October last year; which minority communities considered a great led down. He praised the leaders of the TNA, the JVP, the Tamil Progressive Front and the Muslim Parties for their unwavering stand during the 53 day period, after Rajapaksa was appointed illegitimately as Prime Minister by President Maithripala Sirisena in October. Then, Srinesan reminded how earlier this TNA Parliamentarian, who crossed over to the Mahinda Rajapaksa group, ferociously criticized the highhanded administration of Rajapaksas. He lamented that this crossover incident damaged the image of the TNA, which had stood as a principled political party Sinhala fascism. MP Srinesan added that TNA could not team up with the former President, who was hell-bent in disrupting the current Constitution-making process. It is clearly unethical if policies of a political party changed day in, day out for personal gains. If so the people must reply to those politicians who betray their policies for personal gains in appropriate manner. Some talk about self-governance; some others think about self-governance and only a few realise what self-governance is. These few are the heritage of future generations. According to Sumanthiran, Tamils have not been able to agree to the current Constitution that was brought in by a UNP Government, in 1978. Obviously the previous Constitution brought in by an SLFP Government, in 1972, had not been acceptable to Tamils because their proposals were not included. As the Constitution is the social agreement of all as to how to live in one country, it is important for the Tamils to feel that they are also partners of the process. Sumanthiran represents the Tamil minority community in Opposition within the National Parliament. In democracy, the duty of such Opposition is to present the outcomes produced by minorities – all minorities. Hence ‘Buddhism Foremost’ article in the Constitution cannot be accepted; unless Sumanthiran do that for some tactical purpose. Tamils know about how such an article as it naturally divides Sri Lankans into two. At a recent interview with the BBC Sinhala Service TNA Spokesman Sumanthiran, answering questions explained the reasons for the need of a new Constitution. He categorically assured that their proposals will further strengthen the government to keep the country indivisible.